This wine came to me as a sample after inquiring about a South African Chardonnay (Indaba). 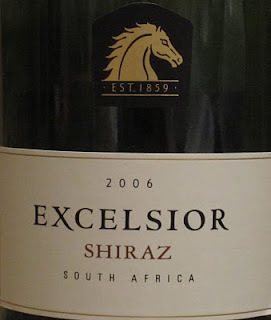 I had asked the importer what other South African wines were being brought to the US and they introduced me to Excelsior Shriaz. It may sound like an awkward way to get introduced to wines although I try to reach out to importers, wineries & distributors to tell me what’s new rather than only relying on the store shelf. This Shriaz has a deep ruby red color with aromas of dark cherries, vanilla and a hint of black olives and pepper. The tastes began with full flavors of black currants followed by dark cocoa on the mid-palate. (I forget that explaining something like mid-palate could be helpful to some...so here's a try) Simply think of the wine in your mouth and the tastes just after the first flavor sensation. That’s the mid-palate. You could also think of the “attack” as the first flavor, the “mid-palate” as the second and most compelling flavor(s) and finally the “finish” which is what’s left on your tongue after the wine leaves your mouth.